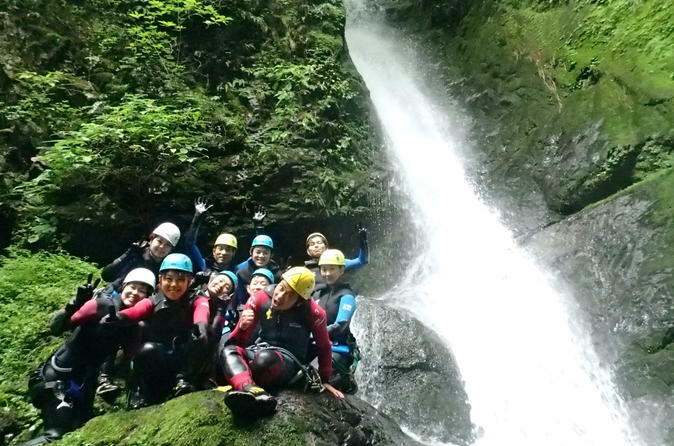 Unbelievable scenic native bushes mixed with some amazing canyoning awaits, right here in Tokyo. Just a train ride from the center of the city will transport you into the luscious green hinterland of Tokyo's Okutama area. Descend moss laden ancient canyons using a variety of techniques; jumps, slides and repelling with waterfalls over 80 feet (25m)! Negotiate your way down steep canyons by abseiling and jumping waterfalls and cliffs, cascading down natural chutes and water-slides and swimming through crystal clear pools. 80% of the time is spent in the water. There are 2 courses to choose from to suit your thrill level; the HOLY course is good for timid beginners, the BIG HOLY course is great for those that want to push themselves and explore into deeper canyons. Our professional team of international guides will be there to support you the entire way. We can customize the trip to your ability and thrill level, so everyone is challenged to the perfect level! When the trip is concluded, meetup with your guide and teammates and look back at a great day on the river. Before you leave your guide can recommend you other things to do in the area such as soaking in the famous hot springs, eating in one of the local mountain food restaurants, or hiking to the spectacular local mountain shrine.